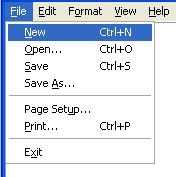 Shortcut keys can provide an easier and often quicker method of navigating and using computer programs. The most common shortcut keys are accessed by using a modifier key such as [Alt], [Ctrl], and/or [Shift] or the [Windows Key] in conjunction with a single character. The standardized method for listing a shortcut is "Modifer plus character". For example "Ctrl+C" is telling you to press and hold the [Ctrl] key while also pressing the [C] key to perform the shortcut. You can find the shortcut keys to most of your popular programs by looking for underlined letters in their menus. In the picture to the right you can see that the "S" in Save has been underlined. Now you know that you can press [Alt] and [S] to access the Save dialog. (Note: Some programs or versions of Windows may require that you press and hold [Alt] to see the menu bar and underlined characters). Some of the common features such as Open (Ctrl+O) and Save (Ctrl+S) have multiple shortcut keys assigned to them.There are numerous shortcut keys that are almost universal in terms of comparability with today's software. I have listed many of these keys below. Look for more shortcut keys in our future Newsletters. Alt + E Edit options in current program. Ctrl + ⇦ Moves one word to the left at a time. Alt + double-click Display the properties of the object you double-click on. For example, doing this on a file would display its properties. Ctrl + Tab Switches between program groups or document windows in applications that support this feature. Ctrl + Shift + Tab Same as above but backwards. Ctrl + Shift + Esc Immediately bring up the Windows task manager. Ctrl + Esc Bring up the Windows Startmenu. F1 Activates help for current open application. Select a different location to browse in the Windows Explorer toolbar. F5 Refresh Contents to where you were on the page. Ctrl + F5 Refreshes page to the beginning of the page. F6 Move cursor to different Windows Explorer pane. Alt + Space bar Open the control menu for the current window open. Enter Activates the highlighted program. Display all available options on drop down menu. * Expands all folders on the currently selected folder or drive in Windows Explorer. + Expands only the currently selected folder in Windows Explorer. - Collapses the currently selected folder in Windows Explorer. Below is a listing of keyboard shortcuts that can be used on computers running a Microsoft Windows operating system and using a keyboard with a Windows Key. In the below list of shortcuts, the Windows key is represented by "WIN". Pressing the Windows key alone will open the Start menu. Lock the computer and switch users if needed (Windows XP and above only). Quickly change between monitor display types (Windows 7 only). Shrinks the window to 1/2 screen on the left side for side by side viewing (Windows 7 only). Shrinks the window to 1/2 screen on the right side for side by side viewing (Windows 7 only). When in the side by side viewing mode, this shortcut takes the screen back to full size (Windows 7 only). Minimizes the screen. Also, when in the side by side viewing mode, this shortcut takes the screen back to a minimized size (Windows 7 only). Below is a listing of Excel keyboard shortcuts that can be used on computers running a Microsoft Windows operating system. Ctrl + Page up Move between Excel worksheets in the same Excel document. Ctrl + Page down Move between Excel worksheets in the same Excel document.